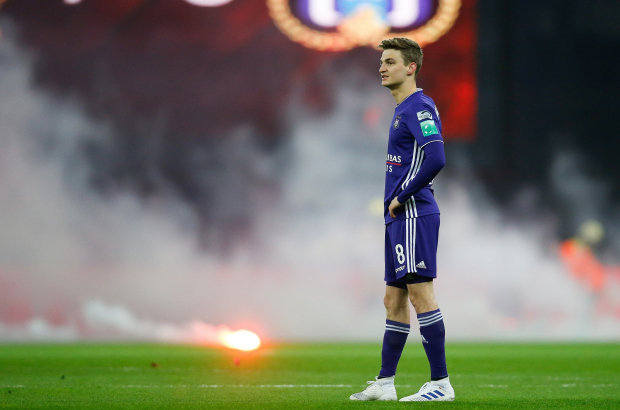 Anderlecht supporters were once again out of control on Friday night, as fireworks and smoke bombs on the pitch and in the stands shut down the match between RSC Anderlecht and Standard Liège. It’s the second incident among RSCA supporters in a week that saw Anderlecht continue its losing streak, putting at risk its usual easy foray into European league play. Sport headlines have reported nothing but bad news of late for the club, which is always found high on the Jupiler Pro League table and has won the league title five times over the last decade. A couple of weeks ago, for instance, Club Brugge won in Anderlecht for the first time in 20 years. But the trouble started well before Anderlecht’s race to the bottom, with the club at the centre of money laundering and match-fixing allegations last autumn. It has stopped paying its players’ agents until the investigation is complete. Then in December, management fired trainer Hein Vanhaezebrouck, replacing him with Fred Rutten. Just before the Brugge loss, Vanhaezebrouck lashed out in the media saying that Anderlecht had become like FC De Kampionen, referencing the popular Flemish TV comedy series about a hapless football club. The Flemish business mogul Marc Coucke, owner of the club since the end of 2017, thought he knew better how to coach the team, Vanhaezebrouck told Sporza. On 7 April, Anderlecht lost at home to Royal Antwerp, and, following the match, hundreds of supporters gathered outside the gates of Anderlecht’s Constant Vanden Stock Stadium. Police secured the exit, preventing anyone inside from leaving the stadium. The crowd chanted for Coucke’s dismissal and for an explanation of the club’s poor performance. At one point, the gate flew open, and they were nearly successful at storming the stadium. Then last Friday evening, supporters hurled smoke bombs on the Constant Vanden Stock field several times, and the match had to be stopped for the smoke to clear. After 40 minutes, and 13 minutes of play, Standard Liège scored a second goal, and the supporters responded with more smoke bombs as well as fireworks. The match was called, and it is unclear at this point if Anderlecht will be forced to forfeit or if the match will be replayed – most likely without supporters present. Police are trying to identify the fans responsible for the interruption, and Anderlecht will have to pay a fine of €50,000 – €25,000 for supporter interference and €25,000 for ending a match prematurely.